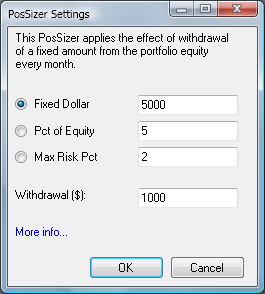 This PosSizer allows to roughly simulate the effect of withdrawing a fixed sum of money from an account every month. It's not possible to affect Wealth-Lab's portfolio equity this way, so you won't notice the withdrawals on your Portfolio Equity tab. However, the cash would not be available for trading, and your system will be operating with a progressively decreasing amount of cash. When the cumulative sum of withdrawals exceeds the current portfolio equity, trading stops.